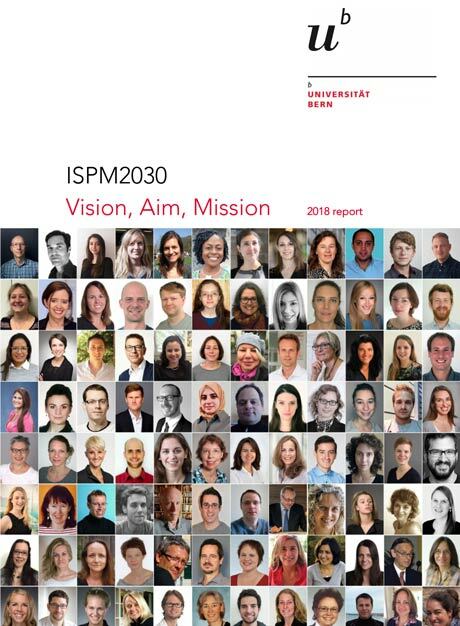 ISPM2030 builds upon the Institute’s strengths and already existing excellence in teaching and research to further capitalize on these assets. ISPM2030 is less a charter for change than it is for addition, transformation, and conscientious development that builds greatness upon greatness to maintain excellence. Our vision is to commit the Institute of Social and Preventive Medicine to global excellence and innovation through local impact. The core aim of the Institute is recovery and active maintenance of health, and prevention of disease throughout life. Our vision, aim, and mission can only be achieved by the active contribution of every member of the organization working in collaboration, with the essential and excellent support provided by central services. This integrative and dynamic nature of ISPM is represented by a new organigram (Figure 1). This overall vision and mission will be achieved by first building and consolidating the foundations of excellence during the first five years of ISPM2030, and further development during the following six years. To build and consolidate its foundation of excellence in the next five years, ISPM's strategy will consist of seven strategic pillars that have a key, underlying aspect: internationalization of the Institute at all levels (Figure 2). These seven pillars and the international character of who we are and what we do will realize the vision, aim, and mission of ISPM stated above, and all will be propelled by the motor of the development of the Institute—ISPM’s talent cycle—which is the cornerstone of ISPM's future at all levels. I Identify: we seek opportunities to encounter and identify talent. S Select: after identification we carefully select talented persons who share our core values. P Prepare: once talent has been recruited; we contribute actively to career development. M Maintain: we seek opportunities for talent to succeed in ISPM or with associated partners.